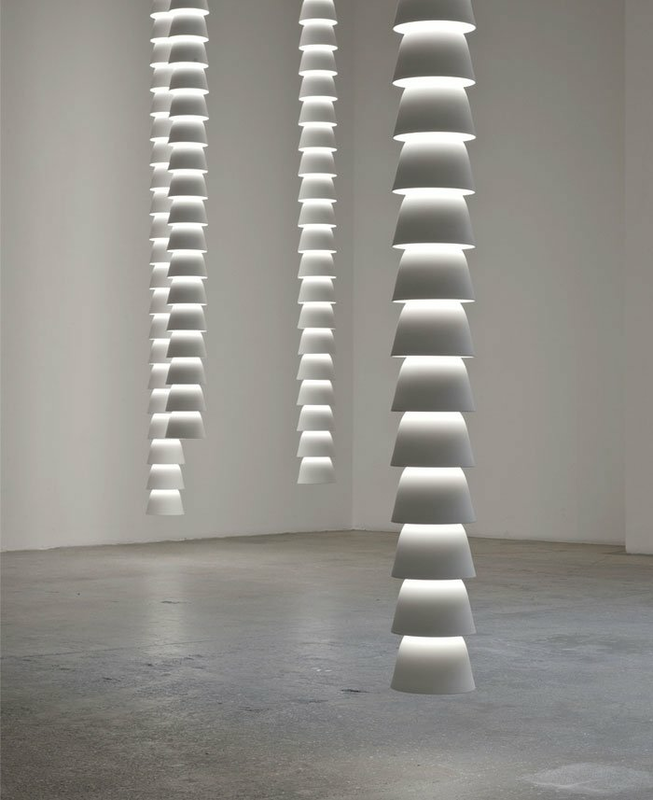 ‘SOMA’ Ceiling Light by Ayala Serfaty for Maison Gerard. 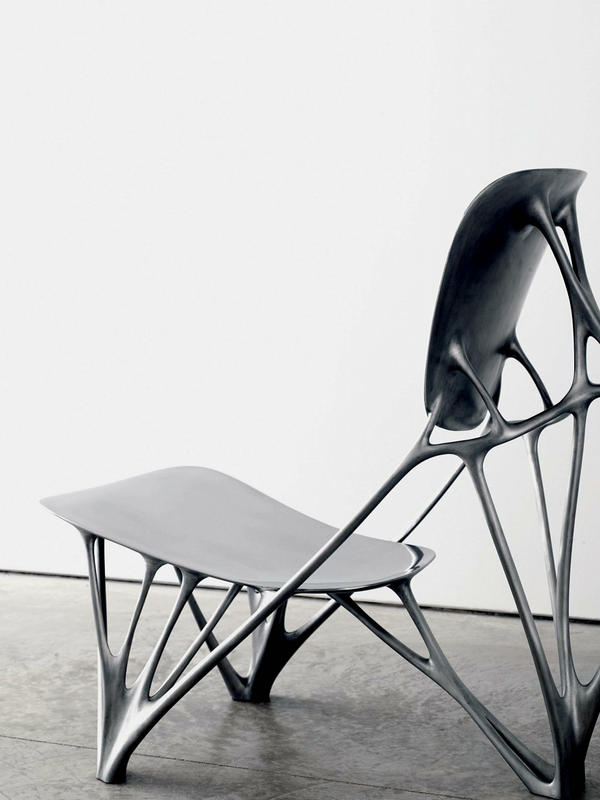 The ‘Bone’ hair in Aluminum, designed by Joris Laarman in 2006 and recently fetched £344,500 at Phillips. My next couple of articles will focus on the territory of collectible contemporary design, which has generated a lot of attention and headlines in recent years, and has to be defined and analyzed for architects, art collectors, and design collectors seeking to explore, invest, and get involved. In the marketplace for collectible design, the contemporary, meaning 21st century objects, has come to the forefront of style and taste, particularly of that of the new generation of art collectors and interior designers. They are often seen in interiors featured in some of the world’s leading magazines. My next couple of articles will focus on this territory, which has generated a lot of attention and headlines in recent years, and has to be defined and analyzed for architects, art collectors, and design collectors seeking to explore, invest, and get involved. While I always advise beginners to use the service of a professional advisor, it is important to get the knowledge one needs in order to develop the taste for contemporary design. If you think that contemporary design can be defined in stylistic terms, or that it has a unified aesthetic character as was so apparent in past styles, then you will be surprised to learn of the enormous scope that typifies the 21st century design found in the collectible arena. While it is always innovative, inspiring, has a certain component of craftsmanship, and informed by narratives, it manifests a wide range of oppositions which have long structured matters of class and culture: high and low, elite and popular, minimalist and ornate, expressive and plain, local and global, familiar and surprising, luxurious and plain. Unlike design one find in high end stores, which is for the most part produced in open editions, the territory of collectible design is outlined by objects produced in limited editions or one-offs. It manifests the design of our era, and thus it is the design that one would find in museum collections, representing the 21st century. Craft and technology represent the most significant contradictions characterize the field of collectible design. Computer generated processes on the one hand, and the most traditional handcraftsmanship on the other are utilized and have come to inform the work of Dutch designer Joris Laarman, represented by Friedman Benda, and that of Tel-Aviv-based Ayala Serfaty, represented by Maison Gerard. Laarman’s fascination with digital fabrications has informed his visual language from the very beginning of his career. 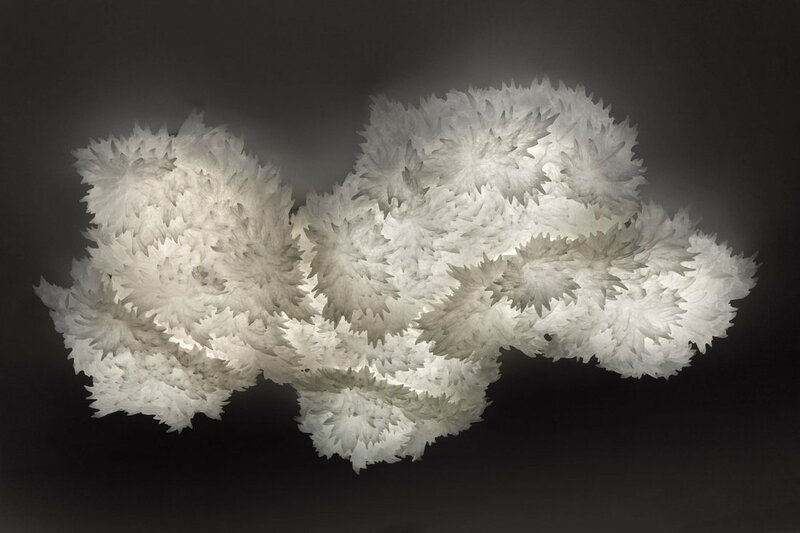 His complex and sophisticated shapes themselves have come to be determined by the fabrication tools and by possibilities enabled by such digital processes as 3D printing and CNC milling machines, which he utilizes as sculpting tools that mimic evolutions in nature. 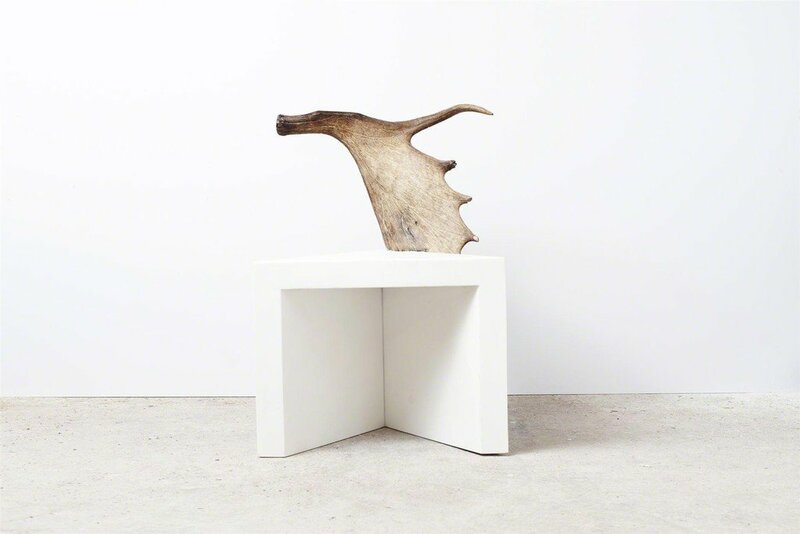 Laarman came to the international spotlight with his Bone Chair of 1998, and then followed up with pieces of furniture produced in limited editions, regularly exhibited at Friedman Benda, where he constantly pushing boundaries. 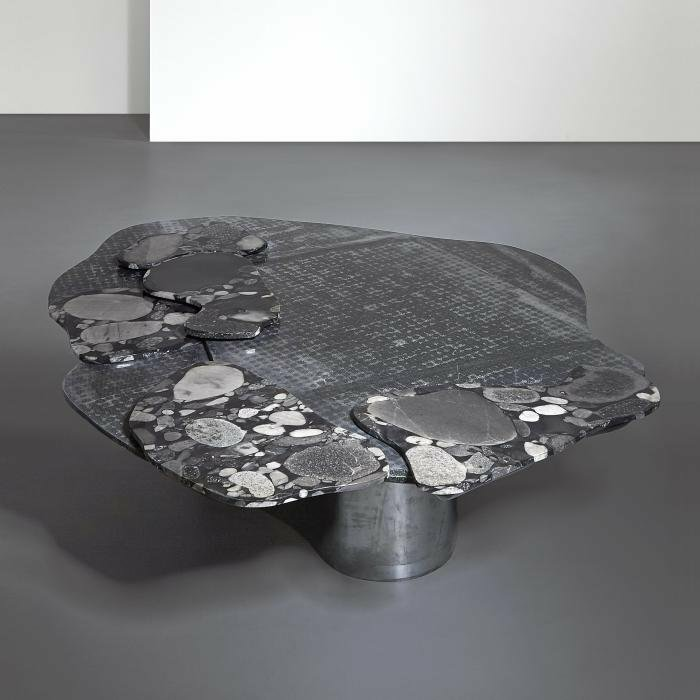 His Bone Chair, of which edition has been sold out has recently fetched £344,500, but his new work can be ordered when the editions are still open. Ayala Serfaty, who was trained in fine arts, has been known for her illuminated sculptures, which she crafts in a method based on the ancient lampwork, a technique she has translated in her own voice. Sarfaty’s enormous chandeliers, crafted at her studio by skilled glass artists, have transformed interiors across the globe into dazzling spaces, crafted for site specifics, and have long considered collectible. In recent years, she has introduced furniture in felt crafted of refined fibers from all over the world, and while felt was the most ancient of all textiles, in her hands, the objects are always expressive, provocative, sensual, and tend to be surreal. 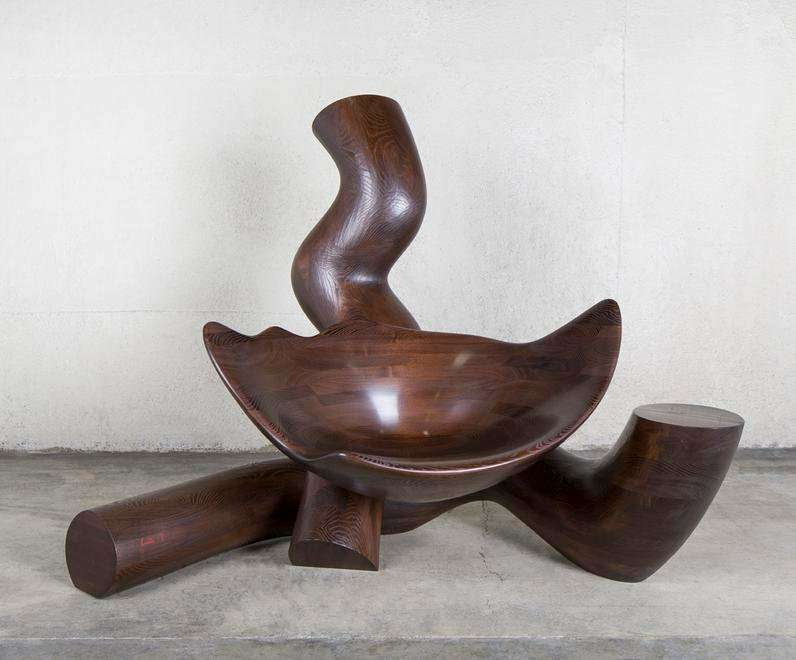 Handcraftmanship has also informed the work of Paris-based Piotr Sierakowski, represented by Twenty First Gallery. 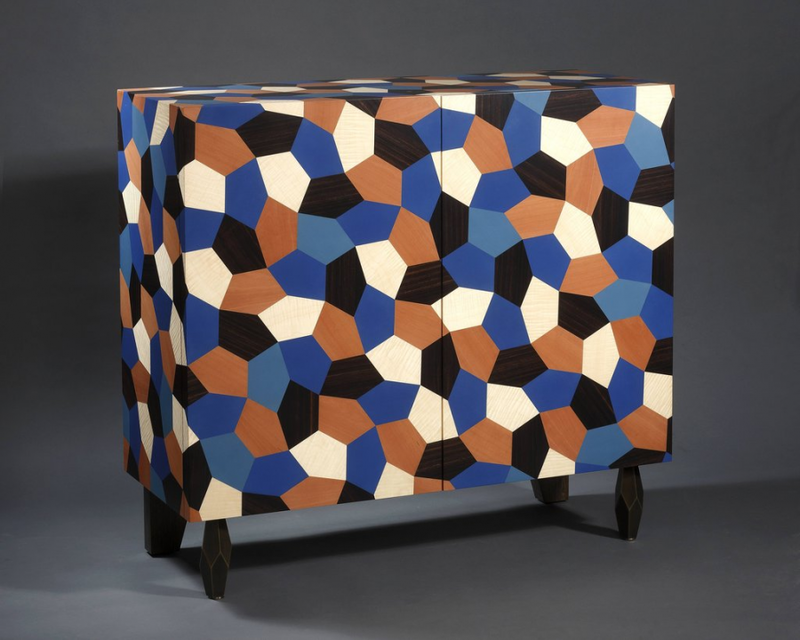 By mastering the most traditional of French crafts, he creates forms and patterns of a great signature style, utilizing rare woods and metal, and produced in limited edition. With the establishment of a design marketplace which has come to provide an infrastructure never available before, new opportunities to showcase and produce collectible design have surfaced, concentrated in the high end design galleries, international fairs, and on internet platforms. The demand for unique, well-crafted, great-designed, cutting-edged objects, has promoted designers of various disciplines to enter this world. Architects, fashion designers, industrial designers, and interior designers all participate in creating collectible design, bringing their own skills, talents, and territories, while broadening the languages and contributing to the creation of some of the best design of our century. A piece of furniture by an architect tends to be architectural, while when created by an interior designer, tends to relate to its place in space. Fashion designers and industrial designers carry their own world into the collectible design arena. Rick Owens, for example, whose furniture is represented by Salon 94, has carried the bold silhouettes of his fashion, deeply rooted in Brutalism and tribal sensibility into three dimensional objects, crafted of bones, wood, and concrete. Italian architect Vincenzo De Cotiis whose furniture is represented by Carpenters Workshop Gallery, brings his interest in row and recycled materials, slavged wood, aged concrete, used fiberglass that he finds in shipyards, to his furniture. French industrial designers Ronan and Erwan Bouroullec whose minimal language has become associated with their work for such companies as Mattiazzi, Vitra, and Herman Miller, also create collectible furnishings in limited edition for Galerie Kreo. ‘Module,’ their recent series of light chains, made from links that can endlessly joined together and suspended from the ceiling is a great example of adapting their industrial skills to the limited edition world. And the furniture that Carol Egan creates for Maison Gerard is so sensible to the interior space, that it is clear it came from an atelier of an interior designer. The thriving marketplace has brought artists and designers who have been active for decades to reinvent themselves and to establish 21st century magnificent careers. The most successful examples of this phenomenon can be found in the careers of Wendell Castle and Maria Pergay, both in their 80s, and both rewarding careers have been enabled by the ambitious dealers who have taken them under their wings. What I find mostly breathtaking about Rochester-based Castle, beyond his superb talent and unparalleled control over his discipline, is the way he has successfully managed to never repeat himself, always inventing, always renewing, never going back, but rather triumphing over and over again in an almost six-decade career. Each chapter is built upon the previous, each comes to mark another step in his immense body of work. Whereas Castle had made his name as a maker mastering the method of stack lamination, his new work is produced by robot that duplicates the work he had previously done in his own hands, bringing him to the realities of the 21st century. The new work of Maria Pergay, which was recently exhibited at New-York-based Demisch Danant, demonstrates that her way to enter the 21st century realm, is by adding narrative to her objects, which are generally made in the similar materials in which she has mastered since the beginning of her career in the late 60s, primarily plexiglass and stainless steel. 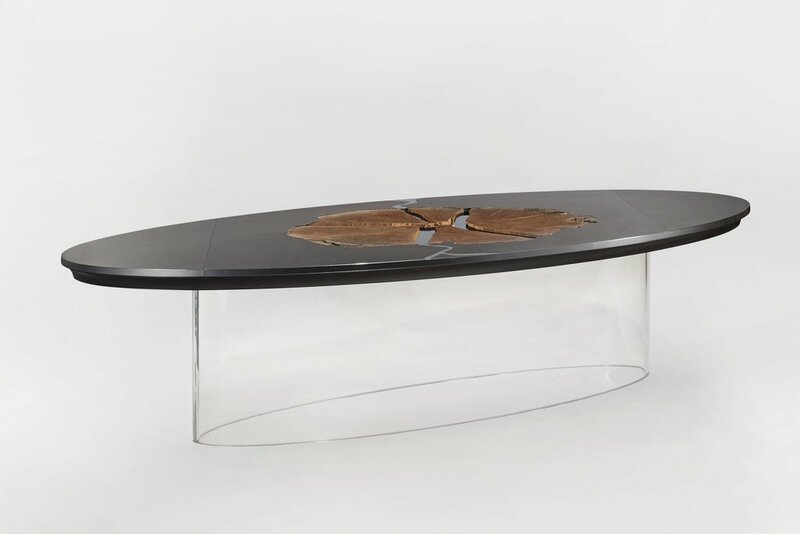 For the exhibition, entitled Wonder Room, and based on the Renaissance cultural phenomenon, she created the Table Marie Antoinette, a sleek dining table in stainless steel and Plexiglas, where a slice of the Queen’s historic oak tree, originally planted at Versailles in the 17th century, and broke down a couple of years ago, is inserted. With contemporary design taking the leading role in the world of collecting, opportunities are continued to expand, boundaries are constantly challenged, and aesthetics are being broadened. This is the first article in a series that comes to explore this territory and the evolution of the marketplace for design.